Often beginners to the sport of bass fishing will fish the banks and visual cover like docks, stumps and so on. Some days this works very well, and other times they will not catch a single fish. It can become a habit when you catch a bass to return to the same spot, with the same lure even during a different time of day, month or season and wonder why there are no fish. This is how a milk run is made. In this post my intention is to help beginners to understand “pattern fishing” after the bass move away from the shallow spawning areas. During the post spawn many anglers give up, especially those who fish from the banks, but there is no need to stop fishing. Understanding post spawn patterns will greatly increase your skill as an angler from late spring until fall. Post-spawn bass patterns will generally divide bass into two groups in many lakes. Those fish that remain in the shallow areas and those fish that move to deeper water in late spring. Do not confuse this with the difference between smallmouth and largemouth, but understanding it will help you target each. Locating and catching post spawn bass requires anglers to develop a patter. A pattern is a definite set of situations or conditions that influence the behavior of the fish in a predictable manner. Fish being creatures of nature, will naturally act in a specific way depending on the season, which is greatly affected by the temperature of the water, oxygen levels, structure, cover, current and food. The first post spawn pattern to develop is for those bass in shallow cover. 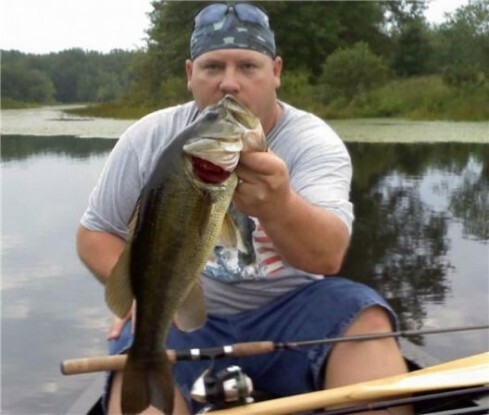 You will find largemouth primarily in the shallow water vegetation such as lily pads and grass mats, shallow rock, boat docks, bridges, laydowns, stumps and brush piles will hold the bass that I refer to as frog eaters. These are the bass that made the soft plastic worm a very popular bait. Weedless frogs and jigs and more recently bird baits are finding these shallow dwellers in the cover. The shallow bass are often seeking comfort, oxygen and food that cannot be found in shallow and smaller bodies of water. A phenomenon in bodies of water called stratification is the reason this occurs. The thermal stratification of a lake refers to the change in the water temperature at different depths in the lake. This is due to the change in the density of the water and with the temperature. Cold water is denser or thicker than warm water and the epilimnion generally consists of water that is thinner than or not as dense as the water in the hypolimnion. However, the temperature of maximum density for freshwater is 39.2 °F. In temperate regions where lake water warms up and cools through the seasons, a turnover occurs. However, depending on conditions, bass cannot always be found shallow. This is when anglers need to also develop a post spawn deep-water pattern. In deeper lakes and reservoirs deep dwelling fish have a much shorter shallow water season. This group of bass I often refer to as shad chasers, the deep dwelling late spring and summer bass. For anglers perusing these fish find their Humminbird sonar unit to be their best fishing buddy. Down scan, side imaging, and 360° imaging features have increased fish finding technology and has given professional anglers the ability to find structure such as humps, ledges, flats, rocks, brush piles, at the same depth that they are finding schools of baitfish. This is usually the depth that the post spawn bass will be located as they relate to structure in their comfort zone. Deep cranking with crankbaits, jigs, Carolina rigs and other deep water lures will bring these bass up from the abyss and from the cooler ledges of the old river banks that existed before the dam was built. Both largemouth and smallmouth will be located deep, but unlike largemouth, smallmouth will relate more to deep water and structural edges than to shallow cover, and can be caught often by fishing a grub or with a tube bait. It is the angler that must determine the fishing pattern; the fish are controlled by nature, the angler by habit. Once you find the bass and develop a pattern you can fine tune your presentation and catch more fish. This is known as developing a pattern inside a pattern and it will come naturally as anglers gain understanding of the instinct and nature of the fish they are after.